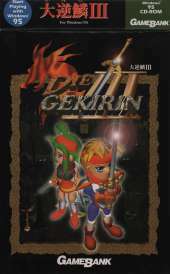 This is a classic RPG work and the third in this series. It takes place in a magical world where six young bloods are fighting for their lives. In the game, the player will be on a magical continent full of treasures and monsters. In order to get these treasures, he will start a long adventure, and he will meet many like-minded friends and challenge the big terrible Devil together. Devil. The game's graphics are a bit rough today, but because of its very attractive story and contains a number of distinctive RPG elements, the game has become an influence on many subsequent games, as the players like to still experience it.